School and to the right of that, above the coaches, are the low grey roofs of new bungalows in Dane Street. 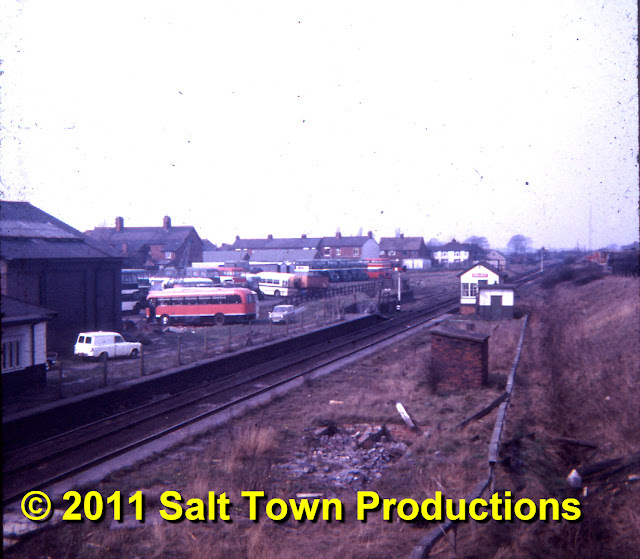 You can just make out the red and white MIDDLEWICH nameboard on the signalbox. This board has been preserved and is now in the safe keeping of the Middlewich Rail Link Campaign. Jonathan Williams Really interesting stuff this Dave. Thanks. I was at St Mary's school until Sept 1973 so this brings back a lot of memories. Sherry Hill-Smith, who now lives in America, took a great interest in these photos of the old Middlewich Station having, during her time here, seen a structure alongside the track which she took to be the old railway station. A pardonable mistake but what, in fact, she'd seen was a relatively new compound, built in the mid-2000s to house some of the equipment needed for a new signalling system on the line. 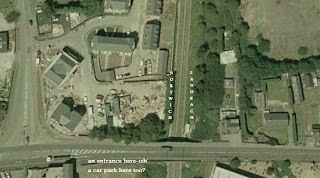 Below are the additional photos and Facebook comments which enabled us to establish where the old station was, and where the proposed new station is likely to be. Dave this is a screen grab of google earth at the railway bridge. I have marked it with an arrow. If that isnt the pad where the station used to sit can you tell me what it is? Hi Sherry. I was wondering if that is what you were referring to. The structure you saw is a compound containing masses of boxes with signalling equipment in them - part of the 'paraphernalia' I was talking about. It didn't exist until a few years ago. A new radio mast, asssociated with train control, is planned for here too The new station site, identified by the Railway Consultancy, is just below this on the single track section (thus needing only one platform). Dave Roberts There would be an entrance to the new station at the Masonic Lodge, with a walkway running from the car park down to the new platform. Likewise, the other structure, at the bottom of the picture, is also new signalling equipment placed on the up platform of the old station. The 1968 picture, and the 1972 one I've just posted, were taken from the bridge, looking in the opposite direction. Sherry Hill-Smith ohhh i'll have another look at the other side of the bridge on Google Earth. Thanks. Hi Sherry. 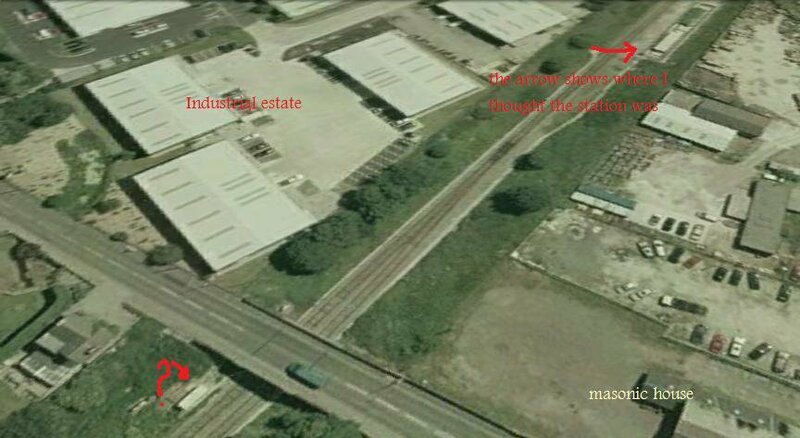 Yes, the Google Earth image of Middlewich is a few years out of date, now and shows the housing development at the station in a partly finished state, but if you take a look at the other side of the bridge, there is a line of evergreen trees running parallel to the left hand track. 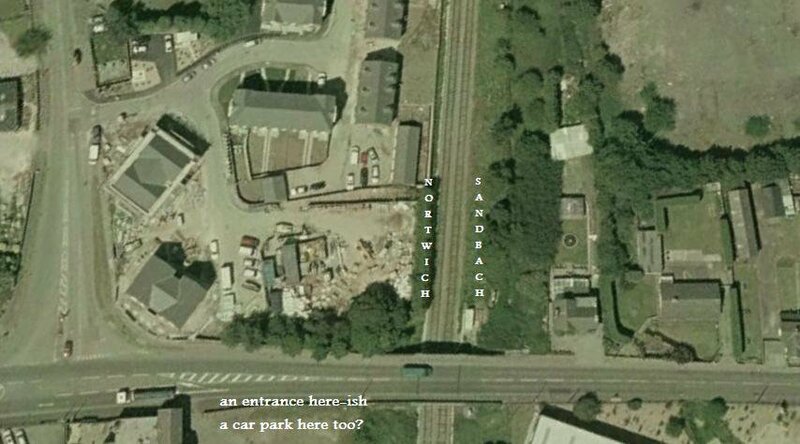 That's the precise location of the Northwich-bound platform as shown in the pictures, and the Sandbach bound platform was, of course, directly opposite. Loads more pictures to come, hopefully most of them not as difficult to pin down as these two were. Sherry Hill-Smith these are great! I just had my head on backwards - loving the pics. ...and following the above discussion, Sherry also added another photo from Google Earth showing the site of the old station as it was in the early 2000s with the houses and flats on the old station site nearing completion -ed. Okay - now we're looking the other way from the bridge - so have I got it marked right? how would folks going to Sandbach access their platform? Dave Roberts There was no footbridge, as such. Instead there were two wooden staircases attached to the roadbridge, and people walked up once side, crossed the bridge on the public footpath and then descended the other. Even after the rebuilding of the bridge there is still a patch of different brickwork to show where one of these staircases once was. Dave Roberts Actually, although this was the official method, in practice a lot of people used the 'barrow crossing' under the bridge (made of old wooden sleepers) to cross the line. Elf and Safe Tea would have a fit these days, of course. Dave Roberts ...and yes, your markings are spot on. I take it the wording about the Masonic Car Park refers to plans for the new station. If so, again you're spot on. Sherry Hill-Smith cool - I guess I'm a bit suprised that the Masons would be willing to give up/sell (whatever) any land - they seem so secretive and this would be quite different to the relative anonymity they currently enjoy. Dave Roberts Ah well...the expression 'cross that bridge when we come to it' springs to mind. It's not the only option, of course. THIS DIARY ENTRY WLL BE RE-FORMATTED SOON. THANK YOU FOR YOUR PATIENCE.